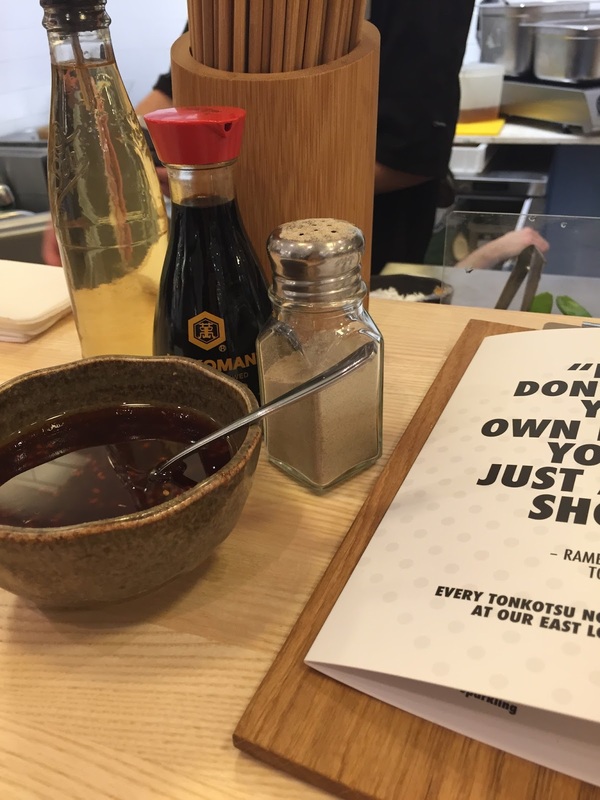 On my last Foodie Friday #22 Battle of Ramen in London, at the end of it I mentioned I was going to try the new Tonkotsu bar in Selfridges, which I did! 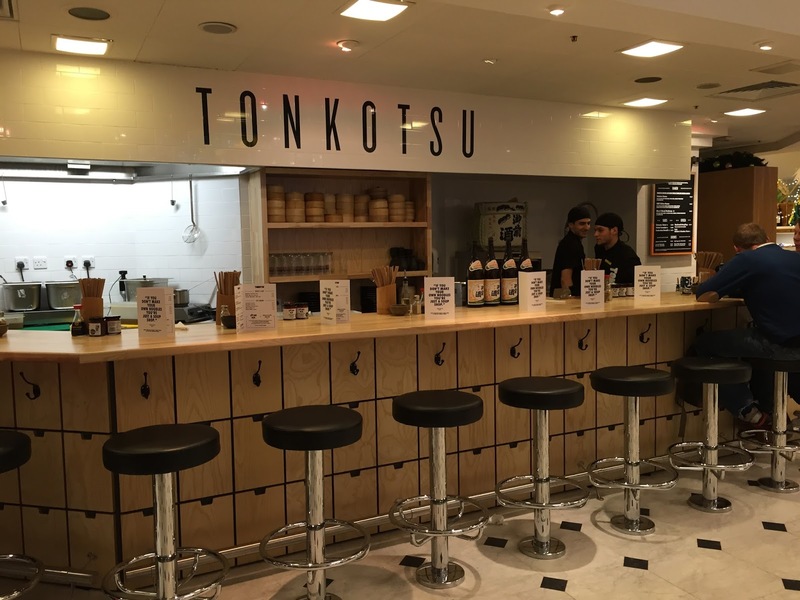 Selfridges is my favourite department store in this world, so if they made a space for Tonkotsu to be in their Food Hall, the noodle bar must be worth trying. 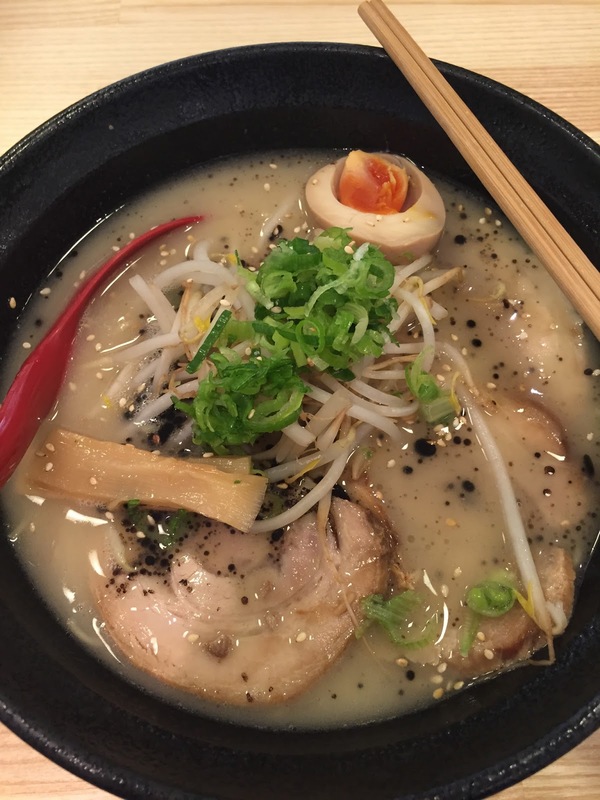 To continue the same comparison, I ordered their classic tonkotsu ramen and a portion of pork gyozas. I was overall pleased with the bowl, half an egg was included, which I liked. Slices of pork were decent, the broth was really tasty. 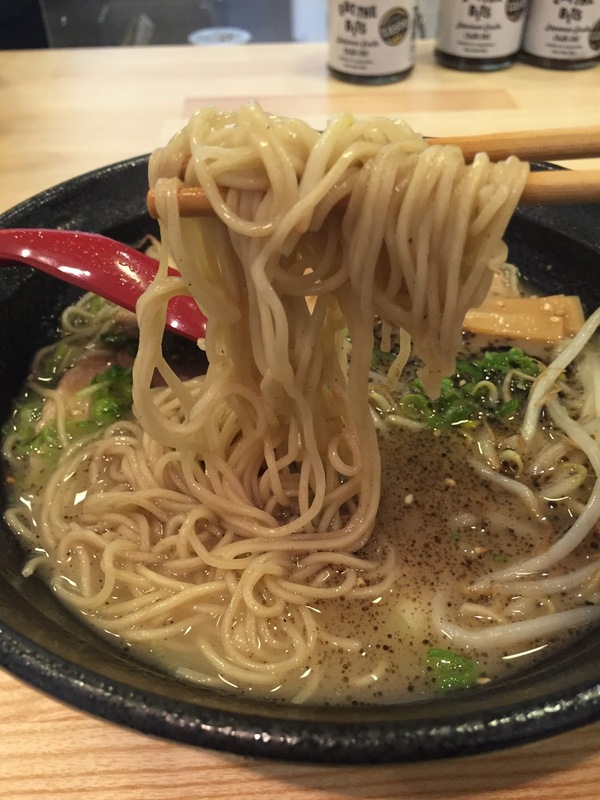 Noodles was a generous amount so I felt full afterwards. The gyozas came in a portion of 5 in a bamboo steamer. They were tasty. But the star of the show was the bowl of chilli oil on the bench. It was spicy but not overly spicy that would burn my tongue. The chilli oil was so delicious that it could be a dressing for plain noodles!!! My only criticism is the overall price. 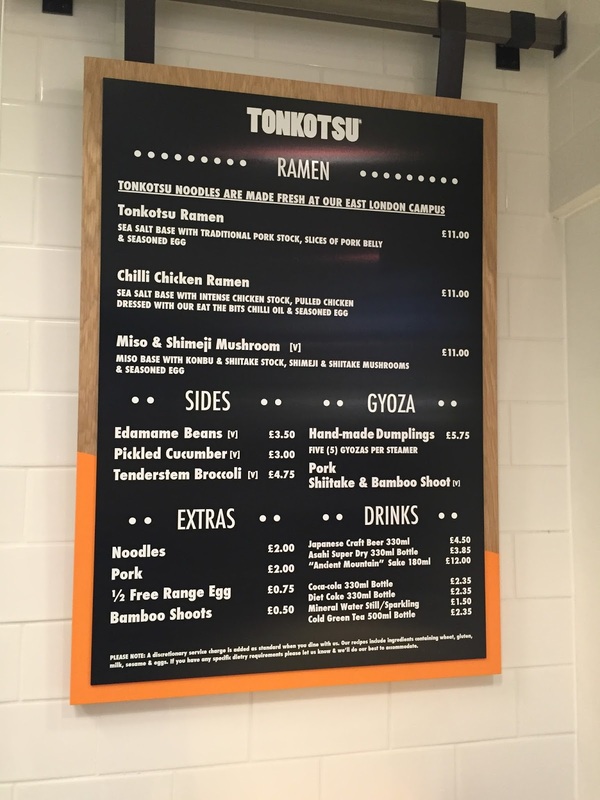 Just looking at the menu, £11 for tonkotsu ramen is acceptable. 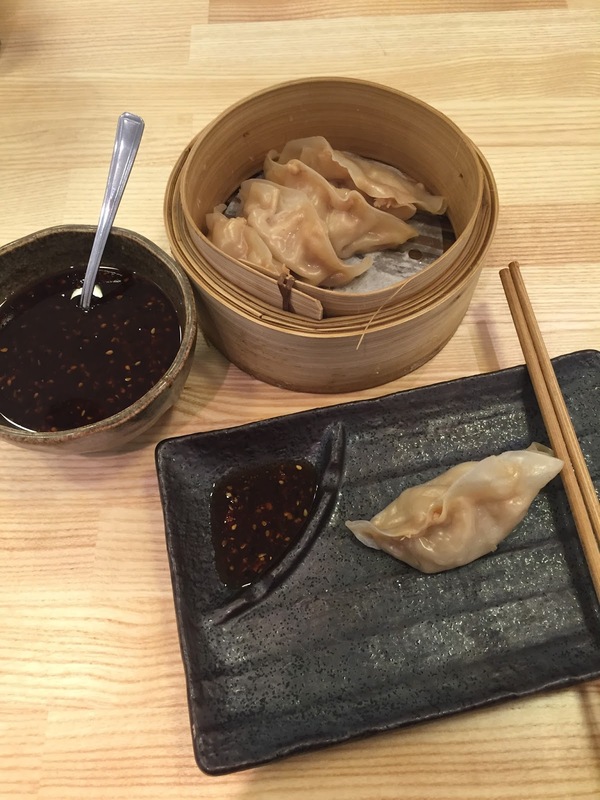 The £5.75 gyoza is a bit pricy but that's a side dish so it can be without. However, I only realised that it had a 10% service charge added on top when the bill came, which bumped up the bill quite a lot. In this sort of almost a "grab & go" convenient style noodle bar in a food hall, I didn't really expect to pay a service charge compare to a sit-down restaurant. I would be more happy to tip if on the bill they put "no service charge, any tips to your server will be greatly appreciated". 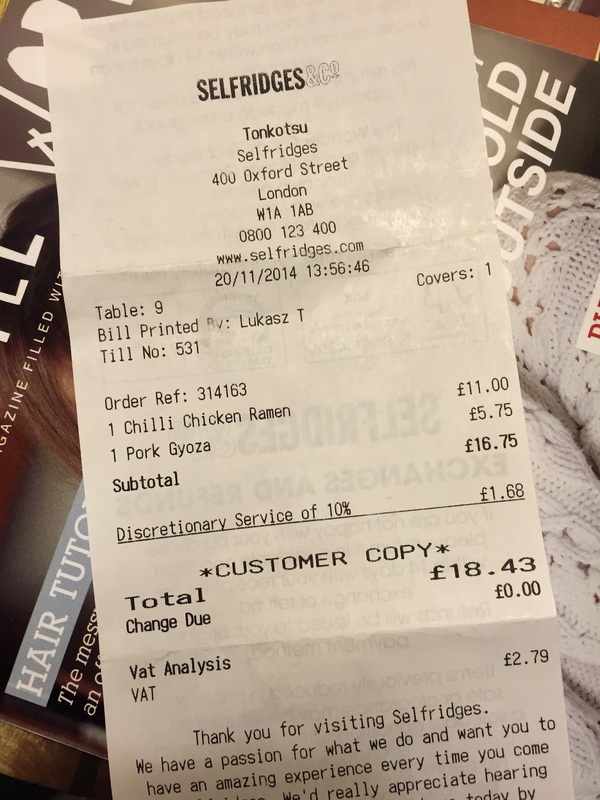 So for my quick bite : tonkotsu ramen £11 + gyoza £5.75 + £1.68 service , all came to £18.43. For one person, no drinks, I found it a bit too pricey. Despite the price, overall I was pleased with the quality of food. A great little stop-by (after making an informed decision) to grab some quick lunch & rest a little during Christmas shopping! *After note: I didn't see the very small "service charge" writing at the bottom of the menu board. But now, you have been warned.